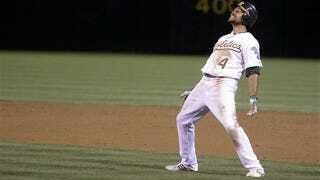 The A's adopted the Bernie Lean as their rally dance last year, and it seems to have been worked. After Coco Crisp introduced the clubhouse to the song (actually, two songs: "Moving Like Berney" by ISA and "Bernie Lean" by ATM & IMD), and adopted the latter as his walk-up music, Oakland went on a late-season tear to squeeze into the playoffs. Oakland will give away the "Coco Lean" bobblehead to just the first 10,000 fans, so start lining up now. Hopefully they'll start working on a Balfour Rage one soon.